Download "Ver. 2. Guide to. 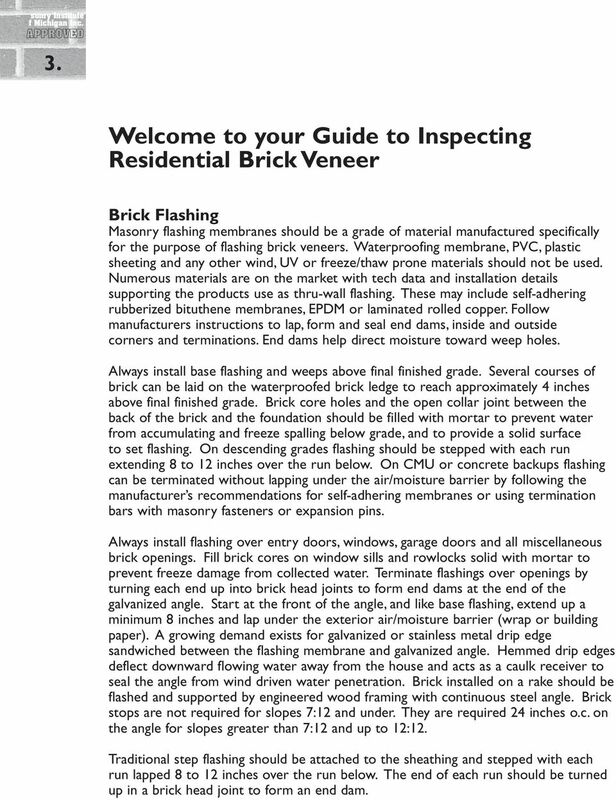 Inspecting Residential Brick Veneer"
3 Inspecting Residential Brick Veneer Masonry Institute of Michigan Inc. 2. F. 22 gauge corrugated wall ties hot dip per ASTM A 153 spaced 16" x 24" o.c.- not to exceed 2.67 sf. per tie w/8d hot dip nails. Additional 12" spacing around openings. A. Terminate foundation waterproofing above final finish grade. B. Lay brick coursing to above final grade and fill the collar joint and brick cores solid with mortar. C. Install base flashing above grade extending to face of brick and lap up and under exterior air/moisture barrier. D. Pea stone/mesh drainage to top of weep. E. Weeps placed directly on the flashing spaced 32" o.c. maximum (24" over openings). G.Extend flashing over toe of angle and turn up and under exterior air/moisture barrier. H.Optional metal drip edge between hot dip angle and flashing membrane. I. 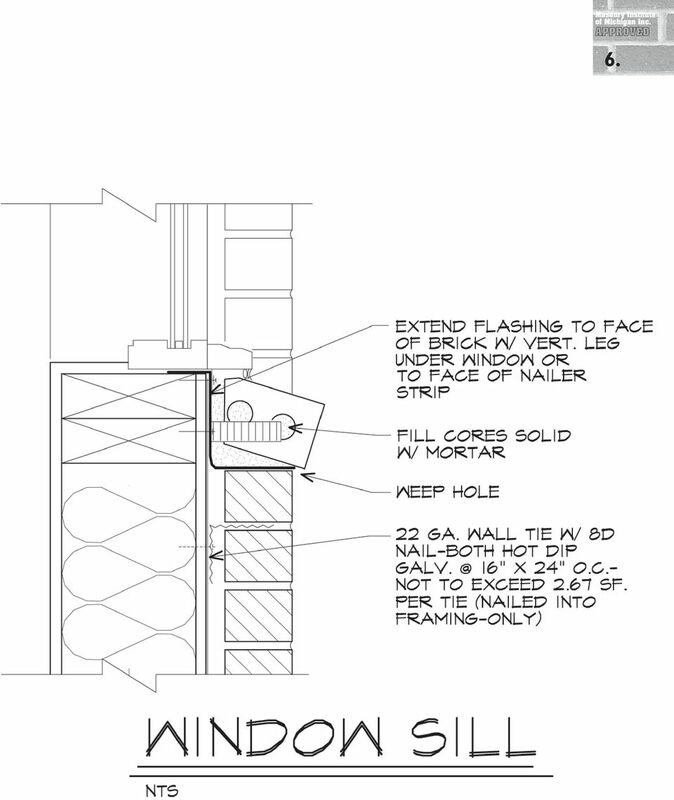 Extend self-adhering sill flashing to face of brick up and under window frame or to face of nailing flange. Install wall ties in head joints of sill brick. J. Self-adhering rowlock flashing extended from face of brick up and under exterior air/moisture barrier with 2" x 2" metal flashing resting on the rowlock course and up and under the exterior air/moisture barrier. 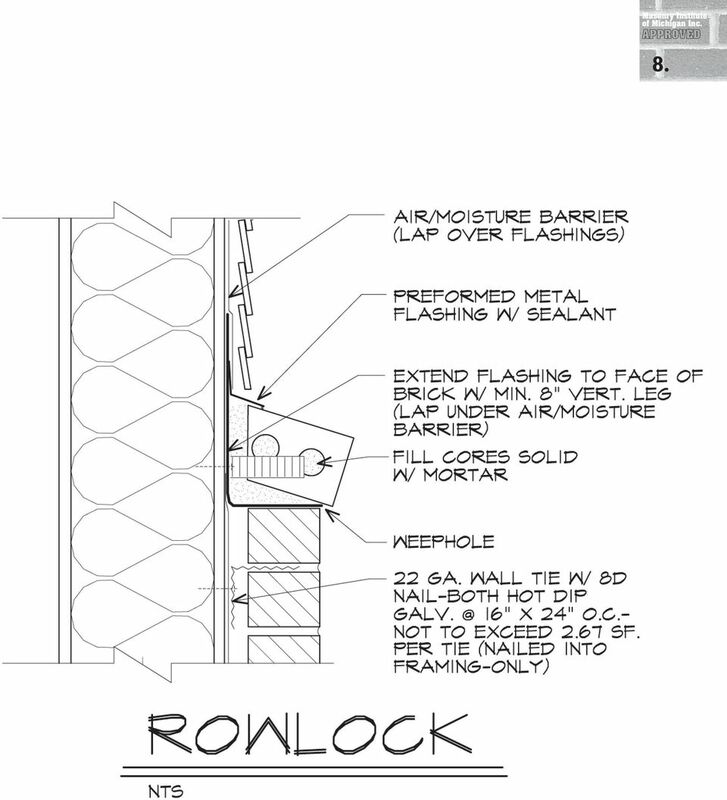 Install wall ties in head joints of rowlock brick. 4 sonry Institute f Michigan Inc. 3. 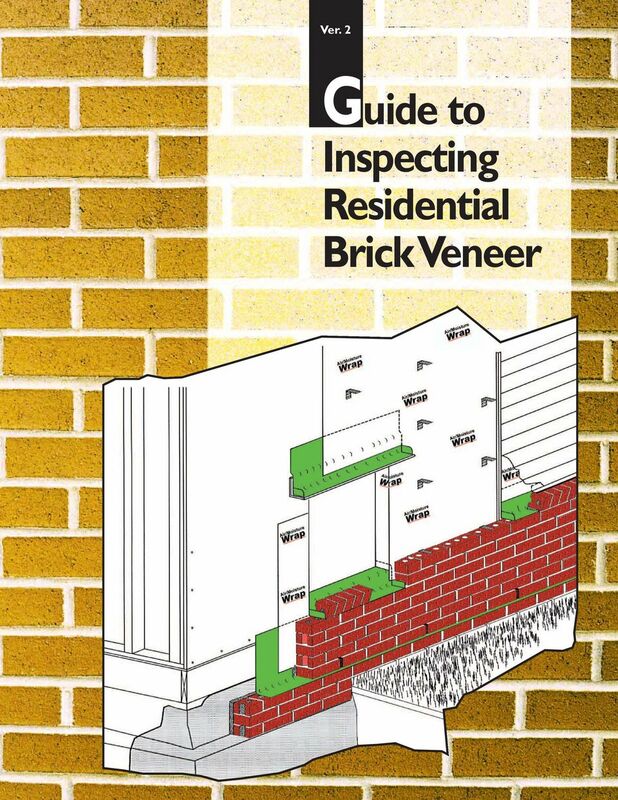 Welcome to your Guide to Inspecting Residential Brick Veneer Brick Flashing Masonry flashing membranes should be a grade of material manufactured specifically for the purpose of flashing brick veneers. Waterproofing membrane, PVC, plastic sheeting and any other wind, UV or freeze/thaw prone materials should not be used. Numerous materials are on the market with tech data and installation details supporting the products use as thru-wall flashing. These may include self-adhering rubberized bituthene membranes, EPDM or laminated rolled copper. Follow manufacturers instructions to lap, form and seal end dams, inside and outside corners and terminations. End dams help direct moisture toward weep holes. 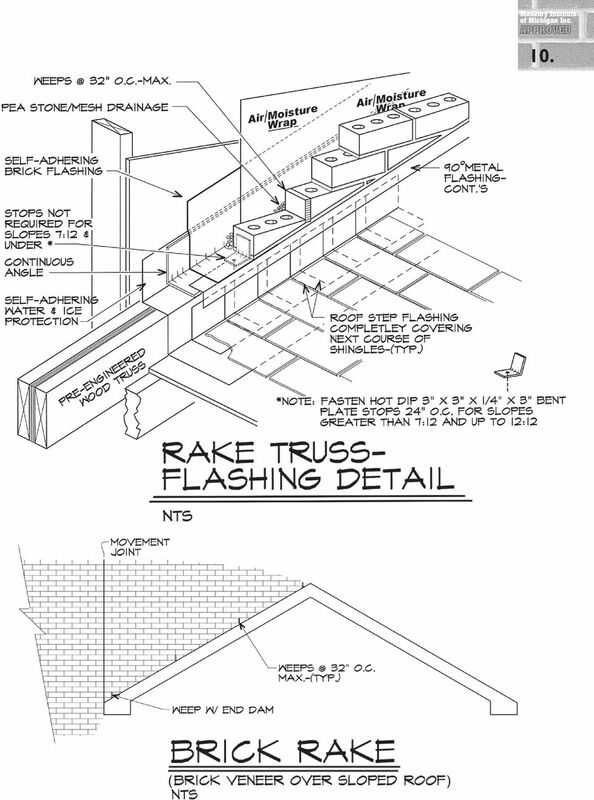 Always install base flashing and weeps above final finished grade. 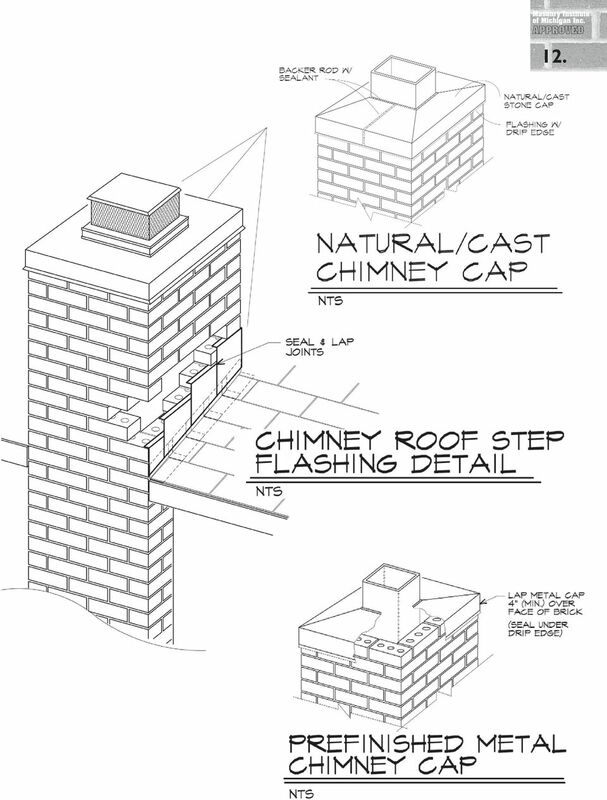 Several courses of brick can be laid on the waterproofed brick ledge to reach approximately 4 inches above final finished grade. Brick core holes and the open collar joint between the back of the brick and the foundation should be filled with mortar to prevent water from accumulating and freeze spalling below grade, and to provide a solid surface to set flashing. On descending grades flashing should be stepped with each run extending 8 to 12 inches over the run below. 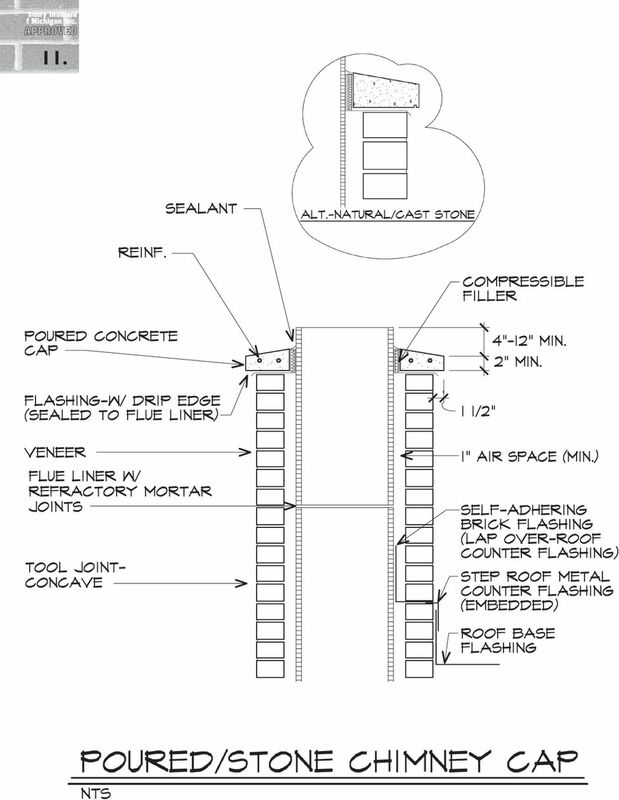 On CMU or concrete backups flashing can be terminated without lapping under the air/moisture barrier by following the manufacturer s recommendations for self-adhering membranes or using termination bars with masonry fasteners or expansion pins. Always install flashing over entry doors, windows, garage doors and all miscellaneous brick openings. Fill brick cores on window sills and rowlocks solid with mortar to prevent freeze damage from collected water. Terminate flashings over openings by turning each end up into brick head joints to form end dams at the end of the galvanized angle. Start at the front of the angle, and like base flashing, extend up a minimum 8 inches and lap under the exterior air/moisture barrier (wrap or building paper). A growing demand exists for galvanized or stainless metal drip edge sandwiched between the flashing membrane and galvanized angle. Hemmed drip edges deflect downward flowing water away from the house and acts as a caulk receiver to seal the angle from wind driven water penetration. Brick installed on a rake should be flashed and supported by engineered wood framing with continuous steel angle. Brick stops are not required for slopes 7:12 and under. They are required 24 inches o.c. on the angle for slopes greater than 7:12 and up to 12:12. Traditional step flashing should be attached to the sheathing and stepped with each run lapped 8 to 12 inches over the run below. The end of each run should be turned up in a brick head joint to form an end dam. 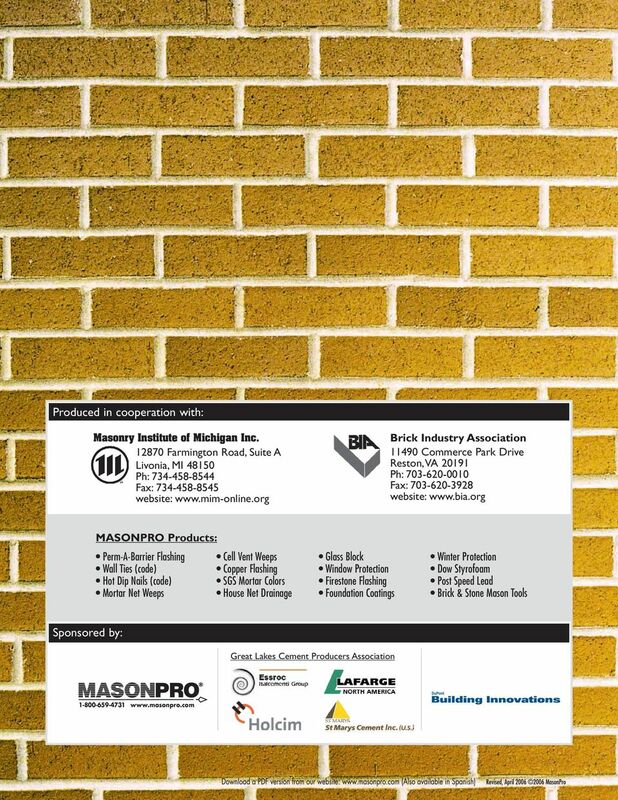 5 Masonry Institute of Michigan Inc. 4. 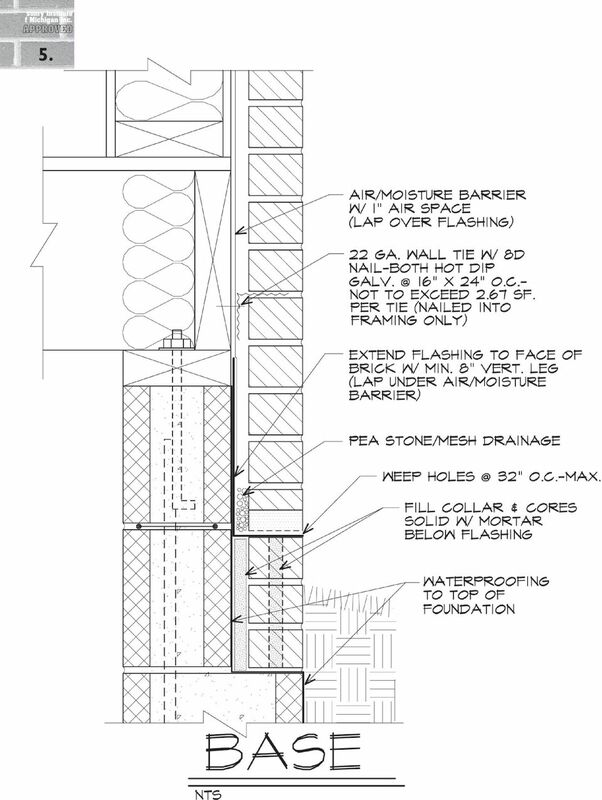 Weeps Weep holes are required at all flashing locations typically 32 inches o.c. maximum. 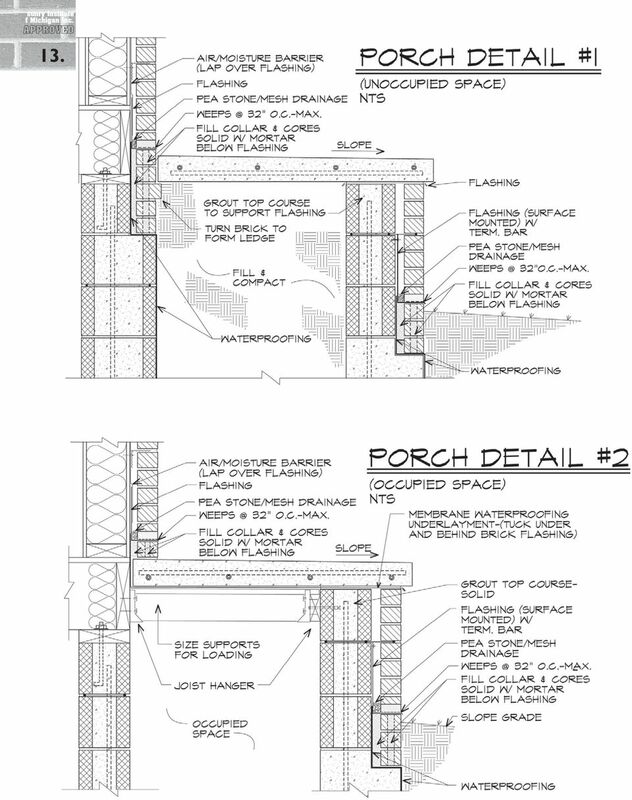 They must be installed directly on top of the flashing in the head joints of the brick by utilizing methods as simple as leaving an open head joint or may include one of countless louvered, vented or drainage screens available in the market. A layer of washed pea stone or drainage mesh placed in the space between the back of the brick (resting on the flashing to the minimum height of the weeps) will prevent mortar droppings in the cavity from clogging the drainage system. Corrugated Wall Ties Code requires 22 Gauge, 7/8 inch x 8 inches, Hot Dip Galvanized, ASTM A153 installed 16 inches x 24 inches o.c. Do not exceed 2.67 square foot per tie. Additional ties are required around openings. 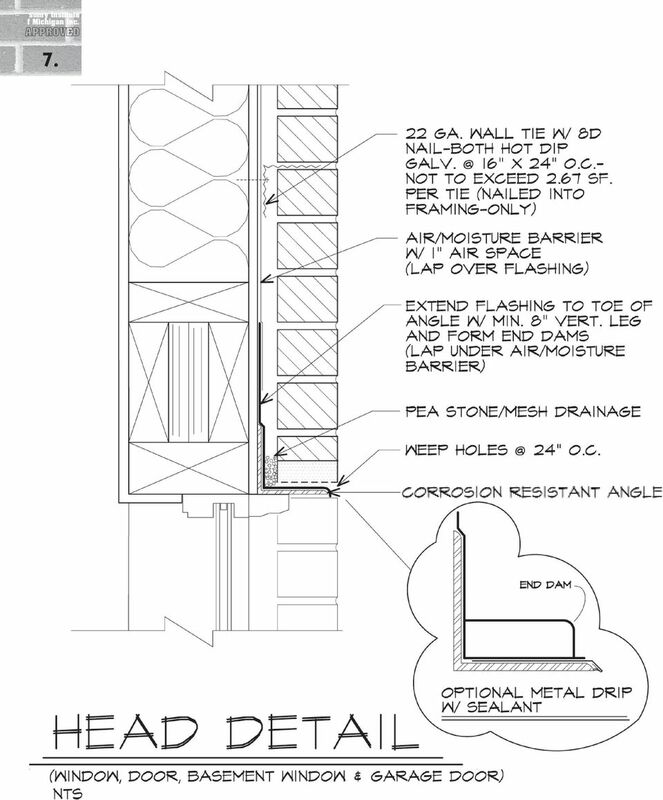 Code-acceptable wall ties are hot dip galvanized after fabrication (mill galvanized ties are fabricated after electro galvanizing and are prone to corrosion around the edges and nail holes). A simple method for checking whether ties are hot dipped or not, is to run your finger over the corrugation. The surface should feel very coarse from a heavy coating of molten zinc. Nails 8d Hot Dip Galvanized. Wall ties should be nailed within 1/2 inch of the 90 degree horizontal bend into the bed joint. Stay a minimum 5/8 inch from face of mortar joint. Anchors for Walk-Out Basement Brick Veneer Adjustable ties for brick veneer over basement CMU or existing poured concrete walls are recommended. They can be installed mechanically using masonry screws or expansion pins. While forming concrete basement walls the forms can be fitted with continuous standard dovetail slots sized to fit slotted brick ties. Stone Accents Limestone veneer units may require stainless steel anchors offering positive attachment to the substrate. Standard L and Z shaped anchors with bends and split-tails to fit into slots in the sides of the stone are available with screw holes for fastening to framing. Window & door surrounds, arches, sills and copings require special attention for flashing and anchorage. Caution should be taken when installing limestone at grade or where salt could contribute to its erosion over time. Chimney Caps Stone, poured concrete or metal chimney caps should be membrane flashed prior to being set or formed and poured. Mortar wash caps perform very poorly and should be avoided. Prefabricated metal caps can offer excellent performance when installed with 4 inches of minimum lap over the brick veneer and ensuring it is properly sealed. Porches and Patios Porches and patios with living space beneath should have formed decking encapsulated with a waterproofing membrane.this membrane should terminate at the brick face on all sides while turning up and lapping behind the brick flashing and under the entry threshold. 6 sonry Institute f Michigan Inc. 5. 7 Masonry Institute of Michigan Inc. 6. 8 sonry Institute f Michigan Inc. 7. 9 Masonry Institute of Michigan Inc. 8. 10 sonry Institute f Michigan Inc. 9. 12 sonry Institute f Michigan Inc. 11. 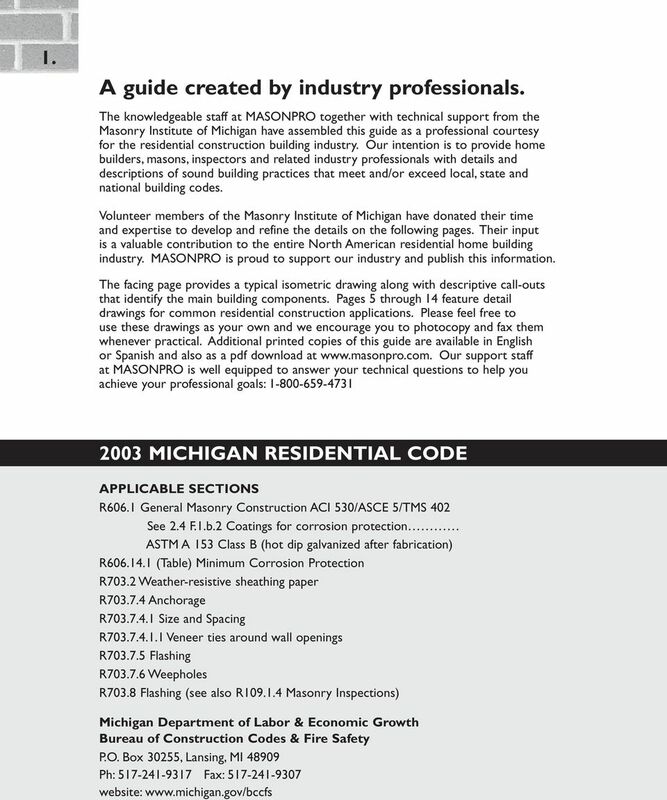 13 Masonry Institute of Michigan Inc. 12. 14 sonry Institute f Michigan Inc. 13. 15 Masonry Institute of Michigan Inc. 14. Please visit our website for additional information and contacts. Detached accessory structures that contain no conditioned floor area are exempt. SECTION 07320 ROOFING TILE PART 1 - GENERAL 1.1 SUMMARY: A. Section Includes: 1. Vitrified clay roofing tiles. 2. Tile accessories. 3. Felt underlayment. 4. Self-adhering sheet underlayment. 5. Snow guards. Table of Contents. 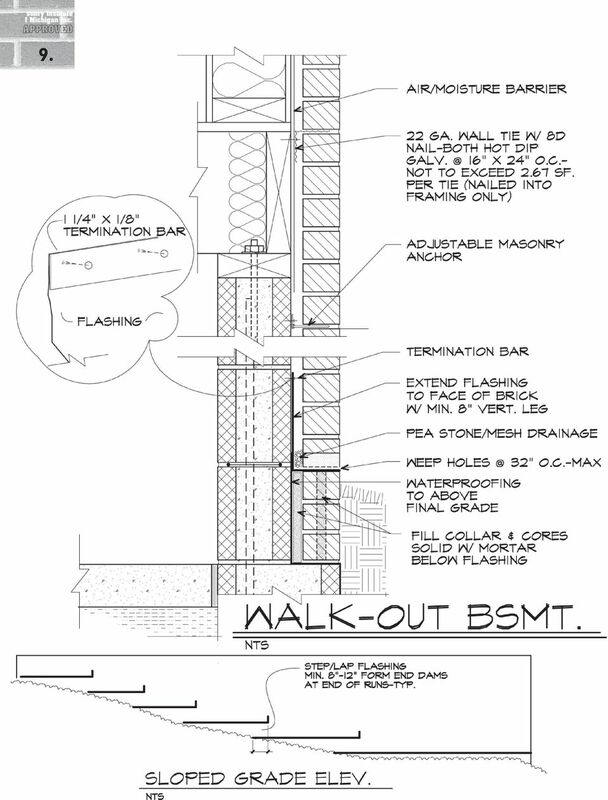 Western States Standing Seam SS675 Panel Installation, Flashings & Shop Drawing Detail Guide. Notes to Designer /Installers..
We urge you to read and follow the attached installation instructions. Failure to do so may void the warranty of this garden window unit. 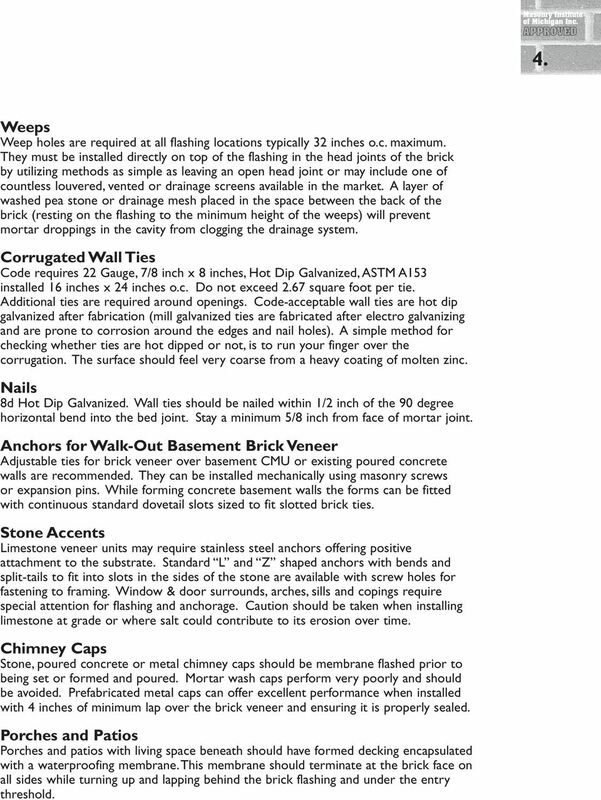 Florida Building Code, 5 th Edition SHINGLE ROOFING Date Issued/Updated: July 6, 2015 This bulletin addresses the current Building Code roofing and re roofing requirements for shingle roofing systems. 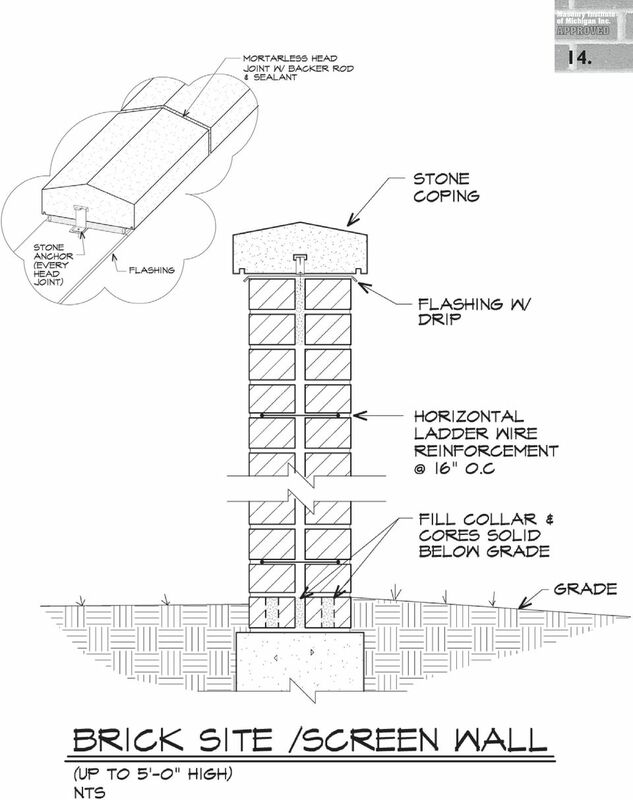 What you need to know about concrete block basement construction. Classic Products, Inc. ClickLock Standing Seam Installation Manual Classic Products, Inc. 8510 Industry Park Drive Piqua, OH 45356 800.543.8938 Table of Contents page Introduction 1. 1 Starter. 2. 1 Panels. Metropolitan Builders Association Masonry & Concrete Standard Background Masonry and concrete work in residential construction often provides the base structure upon which the house is built or as a veneer. B. Flexible sheet membranes for eave protection, underlayment, and valley protection. C. Associated metal flashings and accessories. 1. 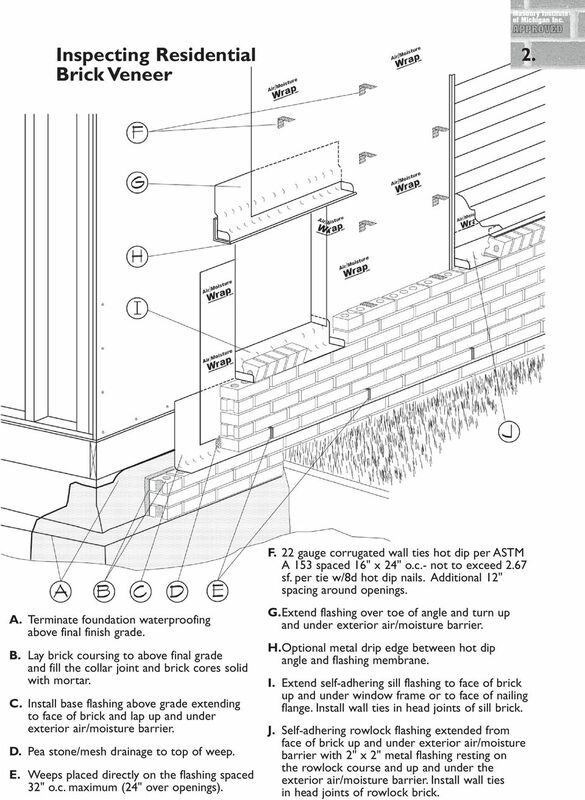 SECTION 07 3113 PART1 GENERAL 1.01 SECTION INCLUDES A. Asphalt shingle roofing. B. Flexible sheet membranes for eave protection, underlayment, and valley protection. C. Associated metal flashings and accessories.